The date is set, the dress is picked out, and the venue has been selected. 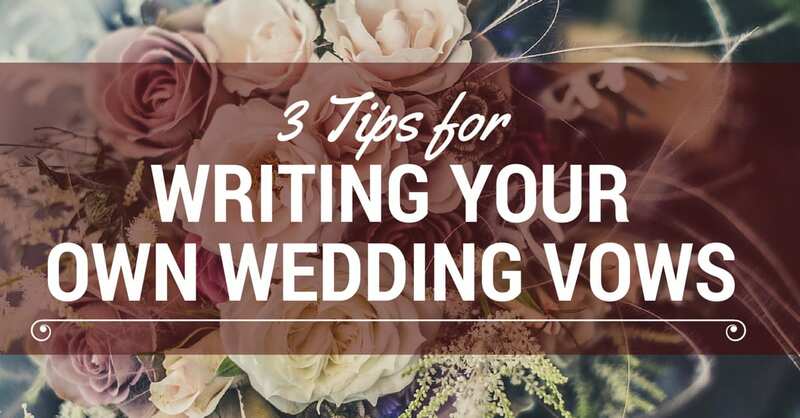 The wedding planning process is moving along, but there’s one thing thing on your wedding stress list that continues to hang over your head -writing your vows. What seemed a sweet and simple gesture, has now become an overwhelming task. There are so many things you want to say, but you’re not sure how to say them. You want to be romantic, but not sappy. Meaningful, but not too serious. Writing your own vows is a special way to personalize your wedding ceremony, but it can be hard to know where to start. Below are three tips to help give you a start in the right direction. 1. Reflect on your relationship. One of the best ways to get started with the vow writing process is to take time to examine your relationship -what made you fall in love in the first place, the highs and lows you’ve experienced together, what qualities does your fiance possess that you admire? Answering questions like these will make it easier to decide what you want to express in your vows. 2. Discuss tone, format, and style with your fiance. One of the most awkward experiences is attending a wedding where it is obvious the couple had totally different ideas about what their wedding vows should be. One of them went for a more humorous, light-hearted approach, while the other was serious and romantic. Don’t be this couple! Come to a conclusion with your fiance what you want your vows to look like. Some couples write them together to make them consistent. Others keep them a secret until the day of the wedding. Either way, communicate. The best way to determine whether you’re satisfied with your vows is to read them aloud. Sometimes things sound different on paper than they do outloud. Practicing your vows a few times will help you locate potential tongue-twisters and make your delivery on the big day much smoother. The wedding day is also very emotional and vowing your life and love to your future spouse in front of your wedding guests can bring on the happy tears. Practicing your vows beforehand will help you keep your emotions in check during the ceremony. Don’t be overwhelmed by writing your wedding vows. Reflect, discuss, and practice, but most importantly, write from the heart.